Just before leaving for Paris, the Canadian government, like many others, stated that “science” was “telling us” that climate change was “one of the greatest threats of our time”. The scientific evidence is clear: climate change is one of the greatest threats of our time. The Government of Canada recognizes that global temperature increases must be limited to at most two degrees Celsius, and Canada’s way forward on climate change is being informed by what the science is telling us. The Canadian government posted up a briefing by “renowned climate scientists Dr. Gregory Flato (Environment Canada) and Mr. Alain Bourque (Ouranos)” to Prime Minister Justin Trudeau, Cabinet Ministers, and provincial and territorial Premiers – see here. 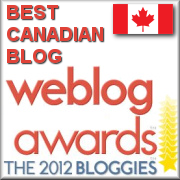 I was particularly interested in their argument on how the “threat” to Canada manifested itself. How exactly does “science” show that a modest increase of temperature would severely damage Canada? Too often, expositions of supposed climate damage amount to little more than loud assertions that the science is settled, with occasional interjections of “Look, polar bear! !” (to modify a phrase from And Then There’s Physics). The Flato and Bourque presentation is in this tradition. Its exposition of damages consists of only a few slides accompanied by very short explanatory text. In today’s post, I will parse the first such slide and will try to parse other slides in future posts. As part of their attempt to show a “changing climate can impact across Canada”, Flato and Bourque presented a slide containing six pictures: a lopsided building purporting to illustrate “loss of permafrost”, a forest fire across a lake, a somewhat geometrically abstract of cracked earth, children playing in fountains, a culvert washout on a secondary highway and ocean waves crashing on a small town. The slide is shown in full below, together with the covering text from the presentation webpage (in italics below). In the past, from time to time, it’s been amusing to track down original images used to supposedly enliven institutional presentations. Readers may recall the photoshopped polar bear used in the illustration of the U.S. National Academy of Sciences petition led by Peter Gleick. (Gleick will be familiar to readers as the former Chairman of the AGU Ethics Committee, who was involved in the forgery of Heartland documents. Proceeding counterclockwise from 12 o’clock. The lopsided building is the former Third Avenue Hotel, built cheaply and quickly during the Klondike Gold Rush. The facade at the front is false, as shown in the view at right. The Canadian government picture is from Alaska Photoworld here, which says that the “damaged building in Dawson City shows what can happen when the warm interior of a building causes the permafrost underneath to thaw”. In other words, nothing to do with climatic melting of permafrost, as claimed by the Canadian government. One commenter below says that the building is south of the permafrost line and that its tilt is more likely due to poor construction rather than permafrost melt in any event. The tilt of the building occurred long before recent Arctic warming. In the collection of the University of Iowa (see here), there is a 1988 photograph showing that the building was already in its present disrepair – which had undoubtedly occurred long before that. The building was of cheap construction in the first place; it looks like the building has been abandoned for many years and, to that extent, the owner of the building incurred little damage from the subsidence. To the extent that the photo is intended to show that changes in permafrost create risk of building subsidence, it seems to me that modern building practices could engineer the issue relatively economically. Earlier in the presentation (under the caption “Impacts have been observed globally…”, they stated that “climate change has had a minor contribution to impacts on wildfires” – a phenomenon that existed long before European settlement in North America. 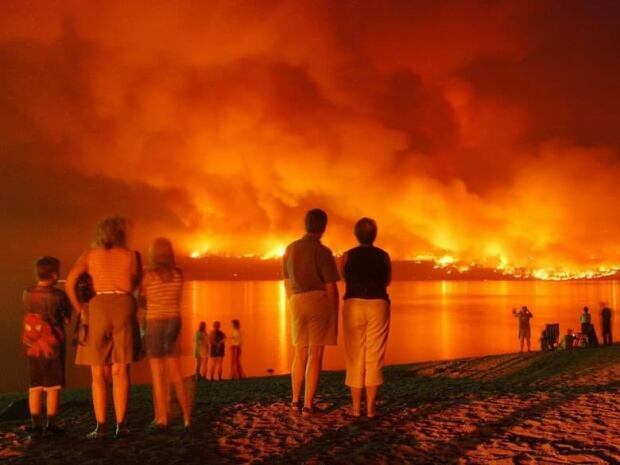 Despite already telling Trudeau and the premiers that climate change has had a “minor contribution to impacts on wildfires”, a picture of a family somewhat placidly watching a wildfire across Lake Okanagan in the large 2003 fire (see here h/t George Applegate ) was included in the Flato montage. I wasn’t able to track the provenance of this specific wildfire picture. If anyone can locate the original provenance of this or the other pictures, I’d be interested. Later in the presentation, they showed a graphic entitled “Summary of number and magnitude of wildfires in British Columbia”, showing that there were more wildfires in 2012 than in 1999. This would seem to be somewhat beside the point, if climate change has only had a “minor contribution”, but nonetheless was a key point of the presentation to Trudeau. 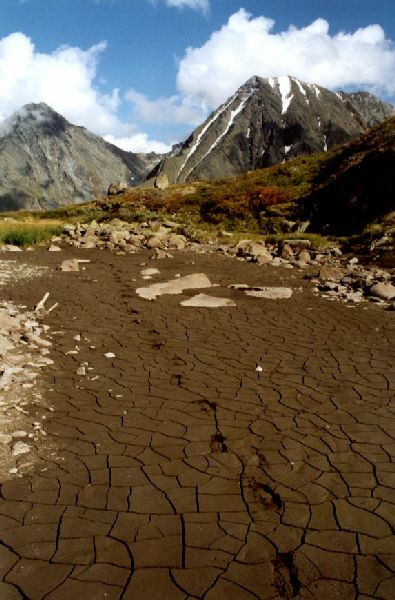 The mudcracks image in the Canadian presentation (h/t Pete Holzmann for lead) was taken in the Altai mountains, Russia in August 2001 by German photographer Stefan Kühn. It is located on the German wikipedia here. Tracing further back, it is located in Kühn’s Altai 2001 portfolio here. in the Google image search (see right), but all or nearly all such pictures coming from outside Canada, e.g. Mexico here. Conversely, images of drought in Canada tend to have a different appearance. Actual pictures of drought in Canada have an entirely different appearance. 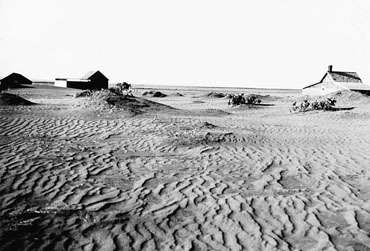 For example, the two pictures below from the Canadian Encyclopedia show the effects of an actual drought in Canada in the 1930s. Had Flato and Bourque shown Trudeau and the premiers (black-and-white) pictures of actual Canadian drought, one presumes that even the politicians would have noticed that the pictures came from long ago and might have questioned the attribution to anthropogenic climate change. But Flato and Bourque precluded that option by showing them pictures of drying mud in the Altai instead. Ironically, IPCC AR5 did not claim that drought arising from anthropogenic climate change was a “threat”, let alone a “serious threat” for Canadians. In the WG2 chapter on North America (WG2 Chapter 26), they expressly stated that it was “not possible to attribute changes in drought frequency in North America to anthropogenic climate change”. Or for flood events, for that matter, a point that I’ll return to, though they warned that other anthropogenic changes e.g. land use and urbanization, had impacts on flood magnitude and frequency. 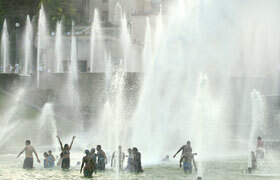 To illustrate the impact of heat waves on Canada, Flato and Bourque showed an excerpt from a picture of children and teenagers playing merrily in the Trocadero Fountain in Paris, France in 2003. Perhaps Flato and Bourque chose an image from Paris rather than Canada in homage to the hosts of the forthcoming climate conference. But surely Flato and Bourque could have located an image of Canadians at the beach – they are easily accessible on Google. It is puzzling to me why Flato and Bourque believed that this image demonstrated that “adverse impacts from climate change will far outweigh the benefits” (to borrow a phrase from Eric Wolff and his fellow critics of Matt Ridley). Or, for that matter, why Trudeau and the premiers were so troubled by this particular image. The only explanation that I can think if is that Trudeau, who is famous within Canada for his “good hair” (indeed, aside from his surname, his hair seemed to be his most obvious qualification for office), was concerned that falling water on unprotected hair could cause untold damage to their hairdos. Trudeau knows that a haircut is only worth what you pay for and he has clearly not attempted to make foolish economies on such an important issue. Trudeau must have recognized that even the most pessimistic climate scientist had not fully considered the impact of climate change on unregulated and unprotected hair care. One of the operating costs of the Canadian highway system in remote northern regions is that culverts occasionally wash out, forcing detours for a few days while the washout is repaired. I wasn’t able to spot the specific incident illustrated here, but the sort of washout is familiar. For example, CBC reported here that a somewhat larger highway washout in New Brunswick would cost $300,000 to repair and take about 30 days to repair, and, in the meantime, a 12 km detour would be required. In a similar incident in Newfoundland, CBC reported that a washout would cut off access to the rural communities of road access for Burgeo, Ramea, Grey River and Francois for six days. Most worryingly, the local member of the provincial literature “said he was told that the break provided a rough moment for a civil servant who happened upon it”. I presume that it would have been somewhat more tolerable if it had been a member of the public who had been inconvenienced, but the incident clearly escalated when it inconvenienced a civil servant. 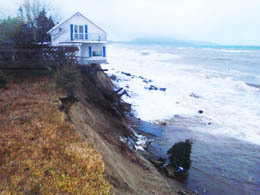 The figures are alarming : 69% of the coastline of the Gaspé and 60% of those in the North Shore undergo erosion. What for? What are the processes involved ? They are natural or anthropogenic climate change related ? If the photograph in question comes from along the St Lawrence River (as appears likely), then there is an additional irony. Locations along the St Lawrence are experiencing glacial isostatic uplift: recent uplift is reported (see here Table 2) at 3.1 mm/year in Rimouski on the south Gaspe shore and 3.5 and 4.6 mm/year in Quebec City and Sept-Iles on the North Shore, resulting in negligible or even negative relative sea level rise. In Hudson Bay in the Canadian Arctic (see NASA GRACE at right), isostatic uplift is over 10 mm/year – the largest in the world. (As land rises in Canada due to isostatic rebound, it results in land subsidence along the U.S. East Coast, which accordingly experiences relative sea level rise from isostasy, quite aside from overall changes in world sea level. There are other reasons why Canada has not experienced damages from hurricane storm surge remotely commensurate to the U.S. Hurricanes dissipate and go seaward as they move north and are attentuated by the time that they affect Atlantic Canada. Second, the Canadian coasts are much less settled than the corresponding U.S. coasts. People apparently prefer warm beaches to freezing cold beaches. heavy weather delaying traffic in Atlantic Canadian towns. And even though IPCC concluded in respect of wildfires and drought, that it was either “not possible” to attribute changes in magnitude or frequency to anthropogenic climate change or only a “minor contribution”, Flato and Bourque added these bogey-men to their montage. This was not the only slide purporting to show damages in the Flato and Bourque presentation. I plan a similar post on a second slide which falls literally into the “Look, polar bear! !” tradition. This entry was written by Stephen McIntyre, posted on Dec 7, 2015 at 9:50 PM, filed under Uncategorized and tagged bourque, canada, flato, trudeau. Bookmark the permalink. Follow any comments here with the RSS feed for this post. Both comments and trackbacks are currently closed. Steve: thanks. Noted up in post. Breathtaking hypocrisy from a “central left” party. Neat example of the power of that Google tool. Well done. Thanks, Pete. BTW I was able to follow the image further: it’s from the Altai Mountains in Russia. http://www.webkuehn.de/fotos/altai2001/047.htm. Mudcracks in the Altai were noted in the 19th century here. shows the mudcracks in a wider perspective, one which does not show a drought, though it does show mud drying, as mud does. 4. Agronomy: this is where my interests primarily lie as a soil scientist. There’s a type of soil that exists all throughout the world, known as vertisols. They are low in area globally, but they dominate arid and semi-arid regions, with 80% found in Australia, India and East Africa [Virmani et al., 1982]. They’re super useful to these environments because they have a high clay content and cation exchange capacity, making them very fertile soils, and they have very high water retention capacities, allowing them to hold moisture during the dry seasons. But they shrink and swell extensively, and can generate massive crack networks, making them very tricky to use. If we can better understand the physical chemistry of these materials, we can better manage these soils. Naturally occurring mud cracks form in sediment that was once saturated with water. Abandoned river channels, floodplain muds, and dried ponds are localities that form mudcracks. Vertisols are apparently excellent at retaining water. I thank you as well, Mr. Pete, for drawing my attention to Google. I haven’t tried it for myself, thinking that it must be a silly pipe-dream to find a image file in web-space (though, I realize how much Google stores, and that it is in their data repositories that they do their searching). If the rain in Maine falls mainly on the Seine, perhaps pretend precipitation in Paris provides pleasure in Pickering? The second “surge” picture was used to announce a conference “Érosion – Quand l’eau gruge notre territoire” at UQàM last year. Doesn’t say where the picture was taken. The original image is http://murmitoyen.com/events/images/thumbs/source2/546128ef47c3c.jpg. The conference announced presentations by François Morneau and Ursule Boyer- Villemaire on erosion by the St Lawrence River on the Gaspe and North Shore. Les chiffres sont inquiétants : 69 % des côtes de la Gaspésie et 60 % de celles de la Côte-Nord subissent de l’érosion. Pourquoi? Quels sont les processus en cause? Sont-ils naturels, anthropiques ou encore liés aux changements climatiques? Ironically, locations along the St Lawrence are undergoing glaciostatic uplift in excess of eustatic sea level rise (see here) and so relative sea level is going down at Quebec City, Rimouski and Sept-Iles along the St Lawrence. If the photograph in question comes from along the St Lawrence River (as appears almost certain), it is experiencing uplift and will not be impacted by sea level rise. Erosion of shorelines by rivers is part of nature. An analysis entitled “Economic evaluation of the potential impacts of the erosion of Quebec’s maritime coasts in a context of climate change by Bourque’s group (Ouranos) is here. The Trocadero Fountains are near the Eiffel Tower. Here’s another picture illustrating the Trocadero Fountain threat that Flato and Bourque so alertly identified. I guess Flato and Bourque figured that a picture with an Eiffel Tower backdrop wouldn’t look authentically Canadian. Sorry to be o/t, wanted to let you know the MM03 link is broken. Please delete this as desired. I can’t get over the impression the authors of the briefing had very little respect for the intelligence of the recipients when implying the construction of a building (which presumably was then inhabited and heated) on permafrost, and then seeing the building subside as the foundation then melted over many years was in some way a sign of global climactic events. Sherlock Holmes might have reached a different conclusion. Thanks to Steve for producing a website that consistently exceeds by many fold the intelligence of the average federal climate lackey. I can’t get over the fact that they prepared a professional presentation with unattributed photographs from areas that have nothing to do with Canada to present a misleading story of doom and gloom. Had I done that in a college report I would have failed, and possibly disciplined for plagiarism. Is this Freud wearing a slip? You have a sharp eye, and yes I did envision the authors wetting themselves in glee. Dawson is well south of the line of continuous permafrost. This means that building may have never been on permafrost as many buildings in the Yukon are not. Sure the ground freezes in winter and thaws out again by summer but builders know how to build for that. When I lived up on the Labrador (Lab City/Wabush area) we didn’t have building collapsing. If the problem is as Dr Flato implies there’d be a lot more than this one decrepit old building falling down. Far more likely is that its wooden foundation on one side finally rotted out. I note Dr Flato’s climate expertise is pretty much all in modelling. ‘Nuff said. Googling “permafrost yukon” yields maps which show that Dawson is in the zone of “discontinuous permafrost at 50%-90%” extent. So there’s a good chance that the building was sited on permafrost. That’s funny. My brother worked for the City of Dawson operating a truck designed to melt permafrost for ditch digging. Q: What’s blue and sleeps two? Their temperature analysis is suspect. They started in 1948 and went to 2012 to show how we are warming. They ignored the warmer 1930’s and early 1940’s which would have given a lower slope. they came up with “Canada is warming twice as fast as the rest of the world.” They did not show what stations they used in their analysis. In the snow cover department they said the area in summer has decreased but ignored the fact that it has increased in the winter. I do not remember if they used the 2 degree tipping point. that should be noted as I think it may have come from economists – was it pulled out of the air? That drought picture is actually a close-up of my left heal, I am out here in the Mojave and it gets pretty dry out here most of the time. Thank you for this post. Having read the Flato et al presentation on Environment Canada’s website, I now understand why Harper “muzzled” scientists – it was to prevent them from embarrassing themselves in public! There is perhaps another level of irony here. Canada would face potentially serious impacts from permafrost melting, although as Craig points out, not because a significant number of citizens will be affected. It is rather that many of the highly lucrative diamond and gold mines that have sprung up in the far North do most of their hauling in the winter over the permafrost. But I cannot imagine that a picture of one of those monster haulers wallowing in the mud in a vast expanse of pristine tundra sends the message they were seeking. Steve: can you identify the “highly lucrative” gold mines that have sprung up in the far North. It’s a hard business. Gold mining is much easier in the tropics. To my (unrefreshed) recollection, here are only a couple of marginal operations. I suppose I should have refreshed my knowledge, it’s been 11 years since the Giant Mine closed! You are right, its all about the diamonds now. Steve: Giant Yellowknife wasn’t a “lucrative” mine even when open. I revised the post to incorporate commentary on pictures identified by readers (h/t George Applegate and Pete Holzmann). Typo in the washout discussion. “…the local member of the provincial literature…” should be “provincial legislature”. Unless he’s a particularly erudite individual with a unique title. I’m looking forward to seeing the rest of the presentation. But we are not sure who invented the 2 degree limit; Jones only popularized it. I thought it was Nordhaus, saying that was what should be the limit because temps hadn’t been higher in the ‘history’ of modern humanity. Maybe I’m wrong. It may have been Nordhaus, I don’t really know. The above link is just one I saved a while ago, but just supports the fact that the 2 °C limit was pulled out of thin air for political purposes and has no real scientific justification. And I recall another attribution, to a meeting held in Stockholm in 1982, but cannot locate its source. As a first approximation, we assume that a doubling of the atmospheric concentration of carbon dioxide is a reasonable standard to impose at the present state of knowledge. First, according to the estimates of the effect on temperature, the ensuing temperature changes would be somewhere between one times and four times the change observed over the last century. Although we do not know exactly what the effect is, we are probably not changing the climate more than has been associated with the normal random variations of the last few thousand years, although we are raising the mean. Hah, I’m so saving this thread (although may be slightly OT). I have a son who just started college this fall and a younger son who is a sophomore in high school. Don’t know how much they have been exposed to the public education of global warming yet, but this will be an antidote showing how different aspects of an issue can be discussed and how different understandings can be put forth and supported by references, and still have a civil conversation. I think the consensus (dare I say 97%?) is that the 2°C limit is bogus, was pulled out of thin air (or somewhere more gaseous), and is nothing more than a political bogeyman to scare the masses. The 2 degree temperature rise goal is clearly quite arbitrary. But that’s not a fundamental objection to it. If you want to encourage action, it helps to have a goal, even if it’s arbitrary (suppose: my weight loss target – to lose 5 kilos by Christmas, so as to reduce my chances of heart attacks and strokes). A bigger problem, to my mind, is the misplaced confidence – always displayed but never justified – that by cutting down CO2 emissions the desired target can and will be reached. Compare my proposing to reach my weight target by cutting out carbohydrates – I’m unlikely to do that, and even if I do, I need great faith to suppose it will have the desired – or any useful – effect. Oops, sorry for my redundant info above… I must have been replying to an older cached version of this article. I don’t profess to be an expert, except for being from Wisconsin which is pretty close, but it seems fairly obvious to me that Canada would benefit rather significantly from a couple degrees of warming. It’s kinda cold. Kind of a short growing season. Might be nice to take the edge off a couple of those things, despite the awful threat of people playing in fountains in Paris. Or is it that if that happened, too many people might come to Canada? That could explain it. •Over 1½ million monthly precipitation totals observed at 1000 stations in 114 countries analysed. •Data record much longer than 3 recent conflicting studies that analysed a few decades of data. •No substantial difference found for stations located at northern, tropical and southern latitudes. •No substantial difference found for stations experiencing dry, moderate and wet climates. I have been, and photographed, the building in Dawson City, Yukon. It is used locally as an example of what happens when there is insufficient height about the permafrost, combined with insufficient floor insulation. It is an old building, built quickly and without either understanding of perrmafrost or heat flow below buildings. Fuel costs were neglibible, too, so there was no concern at the time of heat/energy loss. Permafrost has been disappearing since the end of the ice age. Outside of Calgary, in the Highwood area, we are still getting blocks of buried ice suddenly melting at 7000′ ASL. The melting produces pits, round holes, typically along the valley floor and connected by ragged surface streams. They appear suddenly, but not because of climate change, but because of what happened locally 12,000 years ago, but is still taking its time to conclude. These guys are “scientists?” My God! If this was an annual report to stockholders, these guys would be on their way to prison. Yes, its almost as if someone wanted to point out how badly funded they are, and need some sort of media expert. This is truly amateurish in the extreme, and I don’t mean just the politics. A clear demonstration of the reason why former Prime Minister Harper muzzled free speaking government scientists. And a clear demonstration of the reason why current “Prime Minister” Trudeau unmuzzled free speaking government scientists: fact-free politics aimed right at the gut of his low-information voters. Washaway Beach is, well, washing away. The photo above is number 8 in a series by Erika Langley. Google Earth will locate Washaway Beach, WA for you. A couple of years ago the erosion took a few houses and so was much in the news, but this has been an on-going problem for many years. Figure 3. This damaged building in Dawson City, Canada, shows what can happen when the warm interior of a building causes the permafrost underneath to thaw. Steve: yes, but this is subsequent to the University of Iowa image. 1) It is a sinkhole underneath the center of the building. 2) There is a frozen methane deposit underneath the center of the building, and the entire Dawson is going to blow up. 3) The building is sinking into a hitherto not known gold mine. 4) The photographer is using a wide angle lense. Personally I believe in the 3rd one, because I read Jack London as a kid, but I fear the 2nd one is “correct” and a good story always wins over a true one, but rarely over a political correct one! And forget the 4th, how boring! The building is a POS construction. Anyone with half a brain will recognize it. All construction deteriorates due to settlement and some is accelerated by geological shift and lack of proper drainage. It looks like pre-1930 throw it up and pray construction. Having personally built many buildings, commercial and residential in many environments, all still looking like the day they were completed. This reference contains the following interesting observation, which says that the building itself causes the melting of permafrost (as opposed to climate causing it). Building on permafrost is also challenging. Buildings that are heated from the inside give off heat. The heat can thaw the permafrost underneath the building. Once the permafrost thaws, it sinks, damaging the building it supports (Figure 3). Engineers sometimes solve this problem by preventing the ground under the building from getting warm. They put the building on top of a steel frame, a few feet above the ground, so cold air can flow under the house. The cold air stops the permafrost from thawing. Another way to stop damage from thawing permafrost is to thaw the ground first. This method makes the ground more stable to build on. Then there is no danger of the ground beneath the new structure refreezing, because the structure keeps the ground from freezing. Problem of thawing under warm buildings is the reverse of freezing under indoor ice rinks and large freezers. Solution there is some insulation under slab, layer of rocks with pvc pipe grid through which air is circulated to keep temperature above freezing. 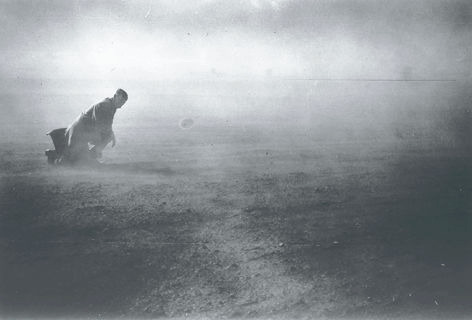 In the scheme of things, keeping soil warm seems easier than cold. So claims Thomas Homer DIxon. “Thomas Homer-Dixon is the CIGI chair of Global Systems, Balsillie School of International Affairs, and a professor at the University of Waterloo. Again, it’s nothing but a failure to communicate — otherwise those “batty” skeptics would fall into line. “Only a couple of years ago, some mainstream skeptics were still saying that the planet hadn’t warmed since the late 1990s, or that carbon dioxide wasn’t the main cause of any warming actually observed. They could be heard asserting that climate change was a scam concocted by a cabal of corrupt scientists to generate grant money and that attempts to introduce carbon pricing were a plot by closet socialists to expropriate people’s wealth and extend government’s reach. Now just people on the fringes openly espouse such views; they’re seen as slightly batty, like birthers, truthers, and anti-vaxxers. Scientific evidence from around the world has been accumulating relentlessly, and this evidence points to a clear conclusion: climate change is real, humans are causing it, and it’s an enormous threat. calamity. In any case, warming’s impacts won’t be nearly as serious as alarmists suggest. So the sensible plan is to adapt. This argument starts with a truth, adds a dose of fatalism and two falsehoods, and then mixes in wishful thinking to produce an utterly misguided and shortsighted conclusion. Perhaps I misunderstand the science. A climate model (IAM) which confirms what common sense tells you. How peculiar. deliberations [particularly on the fabled Hockey Stick] at a high level as he has accurately documented specific failures in the IPCC process, some of which I can attest to, as I was there. Dr. Christy endorsed a funding set-aside for “red team” analysis. Of course, we’ll all do it for free until then. I’m confused. Is someone saying that Canada is better off cold? …one which does not show a drought, though it does show mud drying, as mud does. And unlike this post, which managed to make one slide from “renowned climate scientists” republished by the Canadian government highly amusing, reading reports from the Paris Summit itself is as exciting as watching mud dry. We visited Dawson City last year and saw the ruined buildings shown in the picture. They should be taken down but I suppose there is hope that some of them might be restored some time in the future. The newer buildings seem to be standing just fine. Any tour of Dawson City would be incomplete without a look at Dredge #4. Fantastic. It reminds me of the time I was in Butte Montana and saw the Anaconda open pit copper mine. There was a power shovel at the bottom that would scoop up 100 tons of dirt in its bucket and deposit it in a waiting truck. The scale was gigantic. It wasn’t clear until I saw one of the trucks coming up to the rim of the mine. It was huge close up but tiny compared to the shovel. 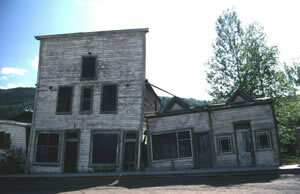 Leaning building in Dawson City. In the spring of 1979 the Yukon River overflowed its banks. 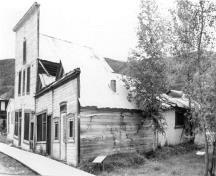 Dawson City was flooded out and damage was caused to a number of the original buldings. I remember looking at that building and asking about it in September. Holy cow my memory is good. Google spring flood 1979 Dawson City. Look at the pictures and tell me what you see. And to think I spent most of my time in Diamond Tooth Gerties!!! I was in Dawson in early September 1979 and I am 99.9 per cent certain that the tilted building was impacted by the major flood that went through the town in May. I would agree that it’s not entirely reasonable to expect a Minister of the Crown to be an instant “expert”, particularly with absolutely no prior experience in the field, after such a short time on the job. From his mother, I guess. It’s a small world. One of the guys in my university fraternity used to date his mother. One of my friends dated the girl who took Margaret to the famous Rolling Stones gig at El Mocambo. I wonder: does our SCIENCE minister have more say than our mere Minister of Warming? We’ve elected a child – and not unlike most children who want to act grown up…there’s usually an adult around to advise him or her. In this case its Gerald Butts – past President and CEO of the World Wildlife Fund Canada. It always seems like Canada lags behind the US in things, as far as a child running your government all I can say is welcome to the club. Presently is seems the inmates are running the asylum. God help us all. PS that God statement is coming from and agonistic. That leaning building is known as the Third Avenue Hotel Complex in Dawson City. Because it leans into each other it has not collapsed. I was curious about the temperature map…. Does this look like it is the same as the temperature map in the presentation? Don’t know who to paste the image — but do a google image search — it looks to me like that image shows up as an “Air Quality” image — not a temperature image. UPDATED 9AM Air Quality Advisory Issued for next 3 days. (November 26, 2015 – Port Alberni, B.C.) The Ministry of Environment in collaboration with Island Health has issued an Air Quality Advisory for Port Alberni because of high concentrations of fine particulates that are expected to persist for the next 3 days. What you see there is gross negligence, lousy highway engineering. The corrugated thing, may be more than one, is a drainage pipe under the road. Done properly, if this blocked or was insufficient the water spills over the road, not leakage through the foundations. What is shown seems to be cheap rough road building, throw in the pipe, probably without due consideration of how large, throw stuff over it, the road foundations, then surface. The real world finds you out, the bridge falls down. Steve: there are thousands of miles of highway in remote Canada and zillions of beaver dams and creeks. At whatever level of engineering is appropriate, culvert washouts are surely nothing more than an operating cost, rather than an existential crisis. Googling “permafrost Dawson city” yields a photo series of this building, including the one in the brochure, with attribution. The Photo of the Dawson building from the U of Iowa is a different photograph from the one given as from the government, at the top of the post. The sky is different, for one thing. Googling “permafrost yukon” will yield a series of photos which include 5-6 different photos of this building taken from the front. I’ve amended the text on the Dawson building to reflect this more accurate identification. Here is a prosperous mining town from the lower 48…………the high altitude ghost town of Bodie in SE Calif. Once had 12,000 people at its hey-day. There are lots of these in the west, Skidoo, Rhyolite, Silver City, Randsburgh and Jo-burg. All very similar to their Canadian cousins. Many of the Cal miners headed north to Alaska and Canada when gold was discovered there. Steve: some of these ghost towns were discussed in very early CA posts on bristlecones. Access to Graybill’s samples seemed to be via 19th century mining roads. Here in Arizona the towns name is Jerome, once over ten thousand now less than five hundred. Excellent crowdsourcing. Or rather host-then-crowd-sourcing. “Canada’s new Liberal government has upped the ante on its promises to help slow global warming, joining other countries at the Paris climate talks that say a previously agreed upon global target falls short of protecting everyone’s interests. So now it’s a 1.5 degree target? Well, we are showing leadership. we are the first to go for 1.5 deg. So how much of that “1.5C” have we already burned through, with no serious impacts unless you count children playing in fountains in Paris? It depends on who is speaking – anywhere from about half to 1.4 deg. Camelot, Camelot? What was I thinking — Oh Yes… Richard Burton! Yes those really are the words — no effort on my part. I saw this on WUWT — I thought it fit in perfectly! The Norman Castle in the picture is one of the finest examples of a concentric castle in Europe. The damage was caused by cannon shot during the Civil War. As everyone knows the civil war was as a result of major climatic changes which took place in the British Isles. Yes, it is well known that climate change leads to civil war and decapitation oh heads of state. That’s why prinny is all beside himself, maybe, especially with such a name as he has. I’m in the process of reading Daniel Boorstin’s great book The Discoverers. Boorstin tells that when Christopher Columbus’ report of his voyages was first published in book form, the publisher used woodcuts from a previously published book as illustrations. Apparently, this sort of thing has a venerable history.